Imagine how smooth you can look only by adding a dinner jacket to what you are wearing for the evening. When you wear a dinner jacket or blazer, you are telling people that you know how to dress and look your best and have a taste for the finer things in life. These dinner jackets by Tazio allow you to express these feelings. Tazio dinner jackets and blazers are designed in Italy and made to make you look great. 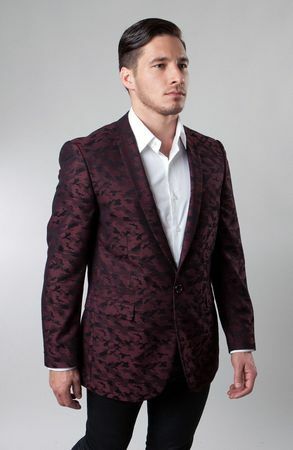 This burgundy color jacket features a patterned design fabric and is made of poly microfiber. It has vents in the back and comes as a modern style fit.